Kleenex by the bed. Actually, I knew someone who had paper towels by her bed. And someone else who had real towels. Whatever your choice, unless you’re a total emo kid, the intent is pretty clear: post-coital or post-masturbatory clean-up. Isn’t it nice to not have to get up immediately? But what if you don’t only enjoy yourself in bed? 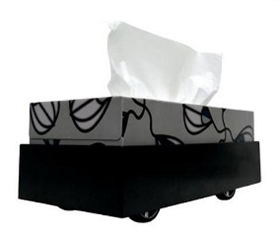 Technology to the rescue: introducing the RC Driving Tissue Box Case. For just ¥3,690.00 (don’t flip, that’s only around US$40.00), you can now bring the clean-up to you via remote control! Technology is a wonderful thing. Of course, you do have to remember to bring the remote with you. But based on some male behavior I’ve encountered, this doesn’t seem entirely far-fetched. I’m looking into getting one of those warm baby wipe dispensers. Classy. Link, please! We want to see it/try it/review it!